This year is the year of gorgeous book covers. Recently, many covers have been revealed and they are literally so blinding to the eyes that you'll have to take a break from admiring them. Today I'll be revealing the cover for Mindy McGinnis's A Darkness So Discreet. Note: This is not part of a blog tour or any event. I just found it too beautiful to not share it with anyone. Here's some details to spark your interest of the book. When her voice returns in a burst of violence, Grace is banished to the dark cellars where her mind is discovered by a visiting doctor who dabbles in the new study of criminal psychology. With her keen eyes and sharp memory, Grace will make the perfect assistant at crime scenes. Escaping from Boston to the safety of an ethical Ohio asylum, Grace finds friendship and hope, hints of a life she should have had. But gruesome nights bring Grace and the doctor into the circle of a killer who stalks young women. Grace, continuing to operate under the cloak of madness, must hunt a murderer while she confronts the demons in her own past. There's also a giveaway over at YA Books Central for Canada/US residents. 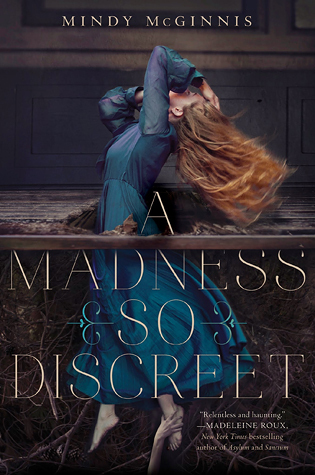 The winner will receive a signed ARC of A Madness So Discreet (when it is available)! Good luck!